These can be prepared as full-size pastries, as they are here, or as bite-sized canapés. Put all the dough ingredients in a large bowl and stir until combined. Tip out onto a lightly floured board and knead until you have a smooth, elastic dough. Alternatively, place all the ingredients in a food processor or mixer with a dough hook and mix until smooth. Transfer the dough to a lightly oiled bowl, loosely cover with a clean cloth and leave in a warm place for 1-1½ hours or until the dough doubles in size. To make the filling, heat the oil in a frying pan on a medium-low heat. Add the chopped onion. Cook for 5 minutes or until softened. Transfer to a large mixing bowl and set aside. Put half the spinach in a large pan over a high heat and stir until wilted (don't add any water). Transfer to a colander and repeat with the rest of the spinach. If you have a huge pan, you can cook it all at once, as long as there is enough room to stir. Once the spinach is cool enough to handle, take a handful and squeeze out as much moisture as you can. Repeat with the rest then roughly chop all the spinach and add it to the onions. Add the remaining filling ingredients and stir well. Preheat the oven to 190°C, gas mark 5. Briefly knead the risen dough to knock out the gas and divide into 15 pieces (about 40g each). Lightly flour a work surface and roll each piece of dough in to a 12cm-diameter circle. Place a heaped tablespoon of the filling in the middle of each circle of pastry. 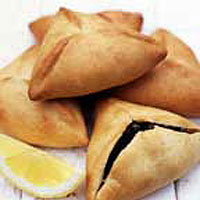 Pull the dough upwards in three sections to enclose the filling and form three-sided pyramids. Pinch the 3 seams together. Carefully transfer the pastries to 2 baking sheets. Bake for 20 minutes or until golden brown, swapping the trays over halfway through the cooking time so that they colour evenly. Transfer to a serving platter and eat hot, warm or at room temperature.